The boom is striking in part because of how simply it was sparked — by a little-noted government policy, implemented nearly a year ago, that suddenly guaranteed generous payments to anybody selling renewable energy, including solar power. Because of that policy, known as a feed-in tariff, Japan has become one of the world’s fastest-growing users of solar energy, investors and analysts say, a shift that comes as this resource-poor country tries to find clean and homegrown alternatives to nuclear power. This year alone, Japan is forecast to install solar panels with the capacity of five to seven modern nuclear reactors. Before the 2011 meltdowns at the Fukushima Daiichi plant, Japan had all but neglected renewable forms of energy, instead emphasizing atomic power, which it hoped would provide half of the nation’s energy by 2030. But the accident at Fukushima forced the shuttering of the country’s 50 operable reactors, only two of which have been restarted. The remaining shutdowns could prove temporary, with Prime Minister Shinzo Abe pledging restarts of reactors deemed safe. A majority of Japanese, though, remain opposed to atomic energy, and analysts say the solar takeoff highlights Japan’s appetite for other options. There is a downside: Renewables are several times pricier than nuclear power or fossil fuels such as coal, oil and gas. The rising use of solar power means energy bills will spike, potentially complicating Abe's plan to jump-start Japan’s long-foundering economy. 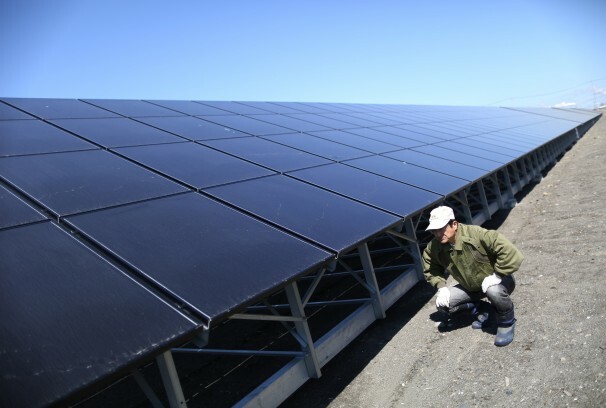 People here tended to support clean-energy projects even before the nuclear disaster, but now there is “more interest in natural energy,” said Moriaki Yoshikawa, the secretary general of an environmental nonprofit organization, Eco Plan Fukui, which has helped build five solar plants in a central region of Japan that hosts four nuclear plants. This year, Japan’s total solar capacity — 7.4 gigawatts at the end of 2012 — is set to roughly double, adding between 6.1 and 9.4 gigawatts, Bloomberg New Energy Finance said in a recent report. Such growth would make Japan the second-fastest-growing solar market behind China and leave it behind only Germany and Italy as measured by total installed capacity. A gigawatt can supply power to an estimated 250,000 homes. The feed-in tariff is the legacy of Naoto Kan, Japan’s unpopular prime minister at the time of the Fukushima disaster, who decided after the meltdowns that atomic power was too dangerous for this earthquake-prone country. So, Kan made a deal with the opposition party: He’d resign only after parliament cooperated to pass several pieces of legislation, including a renewable-energy bill that established the tariff. Japan, Kan said, should boost renewables to account for about one-fifth of Japan’s energy mix by the 2020s. At the moment, they account for about 10 percent, most of it from hydroelectric. The tariff, launched in July, obligates utility companies to buy electricity from renewable sources — solar, wind and geothermal, for example — at fixed prices. In most cases, the utility companies are buying the renewable-generated power from private individuals and companies. European countries have used similar tariffs to spur clean-energy booms, with the hope that widespread installation would drive innovations and lower prices for solar technology. The feed-in tariff is fixed at an artificially high price to encourage start-up investment. The investors, in many cases, aren’t cutting-edge technology firms, but farmers, lumber companies and local governments. Once they install solar panels, they also moonlight as power-generation companies. Under the terms of the feed-in tariff, they sell their renewable-generated energy to the local utility company at rates guaranteed for 20 years. The rates vary depending on the source, but solar is the most generous. When the tariff was unveiled, sellers could get about twice the rate in Germany and France. Japan recently cut that rate by 10 percent, a change that applies to new projects, not those underway. But analysts say that the reduction is unlikely to slow interest among solar developers.